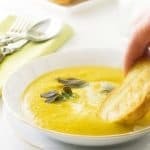 If your days are as crazy-busy as mine are, you will appreciate a hearty, healthy hot bowl of soup for a quick dinner. 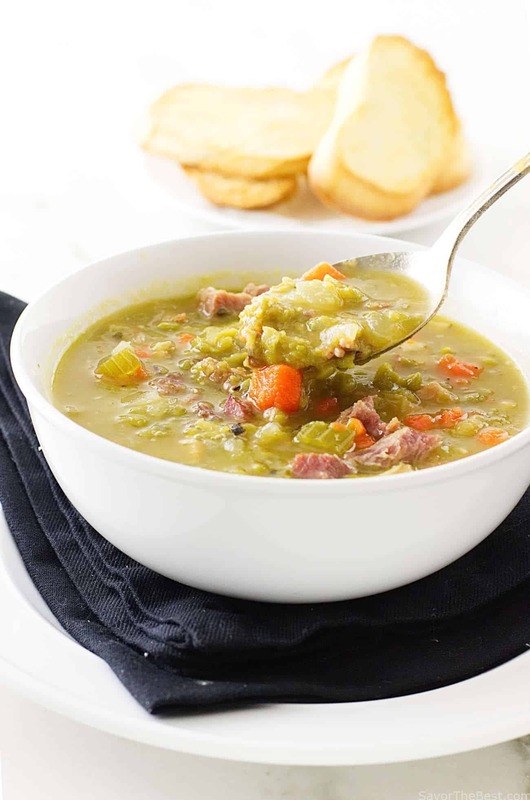 Split Pea and Ham soup is an old-time favorite. Thick and nutritious with lots of ham chunks and vegetables, this comfort food will warm your tummy, heart and soul. Split Pea and Ham Soup! A classic comfort, heart warming soup. 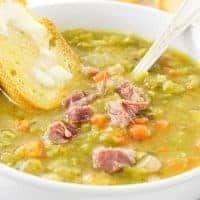 Split pea and ham soup is one of those good ole comfort soups that are extra special in the cold winter months. 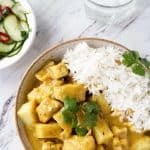 It is big on flavor and easy on the budget. We like it with a lot of smoky ham chunks for extra flavor. Recently, Don and I took a trip to Bend, Oregon and enjoyed the beautiful snowy weather for a few relaxing days. It was a nice break just before the hectic holiday season began. One afternoon we stopped for a late lunch at a quaint little downtown restaurant. Their soup special of the day was split pea and ham soup which sounded perfect. While sitting at a white-linen covered table, next to a roaring fireplace, we enjoyed a bowl of this old comforting soup. 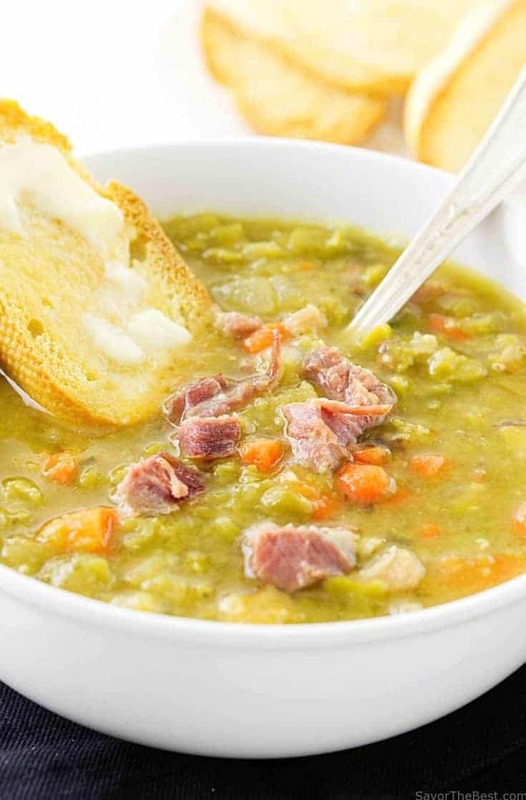 It was a nice relaxing lunch and as we watched the snow falling on the lake, I thought out loud….’this is so good, why has it been so long since I made split pea and ham soup? That was my inspiration for this posting of split pea and ham soup. 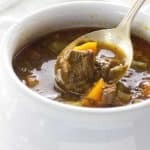 It is an easy soup recipe that is so rewarding in flavor and nutrition. The dried green peas can also be soaked overnight for a faster cook-off, but honestly? It doesn’t take much time at all to soft-cook them in a nourishing, hearty pot of soup. I have never soaked my split peas. We have substituted diced fennel for potatoes in this recipe. The fennel reduces the carbohydrate count and adds great flavor. In addition, it is a much healthier vegetable. Fennel is a non-starchy vegetable and it is delicious in this soup. Fennel has a unique licorice taste when it is raw It adds a subtle earthiness when added to this soup and compliments the vegetables. The stems of the fennel plant have a much stronger flavor than the bulb. I simply discard them as I have not yet discovered a use for them. The feathery fronds of the plant are beautiful as a garnish though. I have also included them in floral centerpieces which adds a lovely effect. If you are not familiar with using fennel, these ideas will get you on the taste adventure trail. 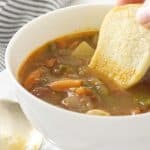 I have included a goodly amount of smoked ham in this pot of soup as well as some flavorful bacon to sauté the aromatic vegetables with and crumble as a garnish. This is truly a good, old-fashioned comfort food that is perfect for our cold winter weather. Make up a pot and enjoy! 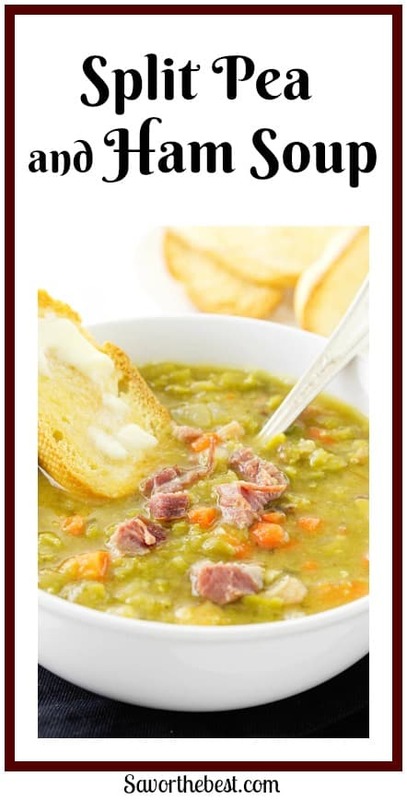 Homemade Split Pea and Ham Soup is a classic, comforting soup, perfect for the cold winter weather. Thick with heart-healthy split peas, chunks of smoky ham and lots of nutritious vegetables. Top with crisp bacon crumbles and serve with chunks of crusty bread. In a large pot set over medium-high heat, add the diced bacon and cook until crisp. Remove the bacon and drain on a paper towel lined plate and reserve. Add the onions and cook, stirring, for 2 minutes then add the celery, carrots and fennel. Cook, stirring, until just soft, about 3 minutes. Add the garlic and cook, stirring, for 30 seconds. Stir in the drained peas and the diced ham. Pour in the chicken broth and add the salt, pepper, bay leaves and thyme bundle. Cook, stirring occasionally, until the peas are tender, about 1 hour. Remove and discard the bay leaves and thyme bundle. Adjust the seasoning, to taste, and serve immediately with the reserved crisp bacon bits on top. 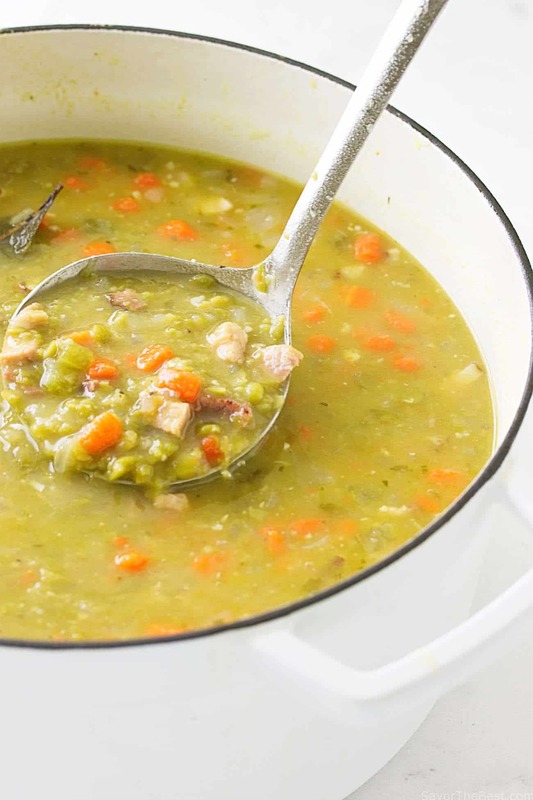 Have you made this Split Pea and Ham Soup? We would love to see a picture. Tag us on Instagram. This looks wonderful! can’t wait until fennel season to try this recipe! Such a terrific soup! There’s a reason split peas and ham are a classic combo. And I never soak my split peas either — they just don’t take that long to cook. Anyway, your soup looks terrific. And it’s definitely seasonal — it’s really cold here! Thanks. And Happy New Year! Thank you, John…..This soup should really warm you up. You are in the deep freeze there!